Time spent, quality, feedback. Practice is a tricky endeavor. You need to work hard for a long period of time and you need a focused, goal-related, methodical practice regimen that is flexible. You need the help of an expert (or many experts) and you need the time to do it. And you’ll need the passion to do it. Because practice is not always fun. There is a lot of research out there so let’s take a look at some of it. If you simply spend the time practicing, you will achieve your goals, right? After all, it has been said that 10,000 hours of work/study/practice is what is needed to become a master. Perhaps. Malcolm Gladwell, who put forward this 10,000 hour idea in his book “Outliers,” has been criticized for oversimplifying many facts from the study of violinists that inspired his “10K rule.” Despite the criticism, Gladwell’s book “Outliers” is worth a look. Is 10,000 really the number? Not necessarily. Different endeavors probably require different amounts of work to master. But the point is that a lot of work over an extended period of time is needed. It’s an important article and worth reading. Dry, but helpful. Ericsson disputes the Gladwell “Outlier” simplification of that 1993 study. In fact, the violin study did not focus on the number 10,000. It focused more on the way that the students being researched practiced. The method of practice that Ericsson and his co-writers suggest in the study is referred to as “deliberate practice,” a methodical way of breaking things down into small chunks and working on the desired skills slowly and deliberately. Focusing only on the amount of time spent practicing can be misleading. I’ve seen this in students who spend time mindlessly repeating incorrect movements rather than slowing down, stepping back and dissecting the correct movement and learning to make their body move that way. Another common time-wasting method I see is to try to play something too quickly too soon, and then to repeatedly make similar attempts at that same incorrectly fast tempo, until in frustration, the student gives up. Both of these strategies are simply a waste of time. The quality of the practice is what is most important. Of course, the amount of time spent is significant, but if the quality of practice is suspect, then the results will be disappointing at best. So, the answer is that simply spending the time is not enough. The time spent practicing correctly is what is important. The quality of practice is the key. Music teachers sometimes focus their students on how much time they should practice instead of how they should practice. If your practice is not producing the results you want, you should consider the following. Are you playing slowly enough? Are you spending your time working on things that you’re not good at or are you just repeating things that you can already do? In my experience, tempo is one of the most common barriers for beginners who are trying to learn new drumming skills. I am constantly asking my students to slow down. Slow is one of the secrets. But it shouldn’t really be a secret, should it? It certainly seems logical that this is how we should learn musical skills. But for some reason, it escapes people. Maybe it’s because of the nature of drumming. There is something about drumming that makes everyone focus on speed. Drum students become obsessed with going faster. I understand this obsession. Really, I do. I want to play fast too. Playing fast is definitely part of the excitement of drumming. But the truth is that one of the most important elements of effective practice is to go slow. I promise you this is the truth. Accomplished musicians can attest that slow practice is one of the keys. What they found was that the amount of time that the pianists practiced did NOT correlate to the successful playing of piece that was presented. In fact, it was the method of practice that correlated with the best performers. 3) The identified area of difficulty was repeated until the error was corrected and then the entire section being worked on could be played from start to finish with no errors. This slow, methodical practice, including the isolation of problem areas and the change in tempos (not the amount of practice) is what separated the best performers from the others. Imagine if you spent a lot of time practicing AND used this slow, deliberate method of practice…how good could you get then? One last thing. 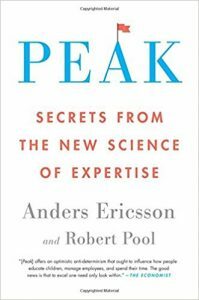 Anders Ericsson, one of the original authors of the violin study, has published many books on the subject of how to gain expertise. His latest book is called “Peak:Secrets from the New Science of Expertise,” and it was published in 2016. It could be worth a read.